"Although rabbits are the third most popular domestic pet in Britain, RSPCA statistics show that they are often the most neglected. Many still live lives of solitary confinement in small hutches, without the opportunity to satisfy their basic fundamental needs. Rescue Centres are full of rabbits who have suffered through the ignorance of their owners and then, through no fault of their own, become unwanted. 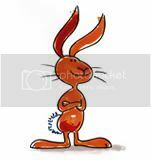 Sadly many pet owners do not understand just what a rabbit needs to live a healthy, happy life." The Rabbit Welfare Association & Fund. The animal welfare act was improved in April 2007. It is still against the law to be cruel to an animal but now you must also ensure that all the welfare needs of your animal are met. For a rabbit owner this means it is not acceptable to keep a solitary rabbit in a small hutch, without the opportunity to exercise. 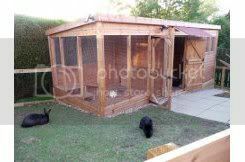 Rabbits can be just as happy living indoors with you or outdoors in a spacious hutch in a sheltered part of the garden. We can offer advice about the size of hutch and run for the individual rabbits concerned but as a guideline we agree with the Rabbit Welfare Association who say the hutch should be as big as possible and a pair of rabbits need nothing smaller than a 6ft x 2ft x 2ft single tier hutch or a double tier 5ft x 2ft x4ft hutch if living outdoors, with a secure area to exercise. Rabbits do not have to live in rabbit hutches - there are lots of different ways to make spacious and comfortable living accommodations for your bunny! Wendy houses and sheds not only make excellent homes for bunnies they also give great shelter for you in our temperamental weather meaning you can clean out and cuddle without getting wet! These are often a better alternative especially for the large or giant breeds of rabbit like Jura, Iona and Aaran who live in "Bunnyopolis" and are the proud owners of an insulated, heated and lit home! Free ranging is the best form of exercise for your bunny and if you can make your garden, or an area of your garden, secure for them to explore and binky round then they will love you for it! When you cannot be home then they need to be safe and secure; Rosie and Casper have their own run around system, a secure inter-connection of tunnels which allows them lots of space to run and play securely when their Mum can't be home to supervise them in the garden. 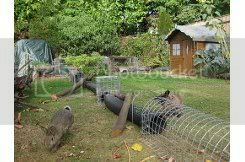 Mario, Billy, Bunty, Shine and JJ have their own shed and free range of the garden when their family are home but, when they are out, they have their aviary out the back where they have lots of space to run and play. They have easy access via a cat flap which takes very little time for a bunny to learn to use and also helps keep their shed snug and warm during the winter months. The indoor home needs to provide not only somewhere secure for the buns to retire to but also be a safe environment which protects them from wiring and other potential hazards. They need the minimum exercise area when confined and an indoor cage, whilst generally too small to shut your rabbits away into, provides an excellent base for them to chill, litter and eat. Puppy panels can easily be attached to provide them with an accessible play area while you are out.